Background : Son of Marion Linklater of Red Cliffs, Victoria. 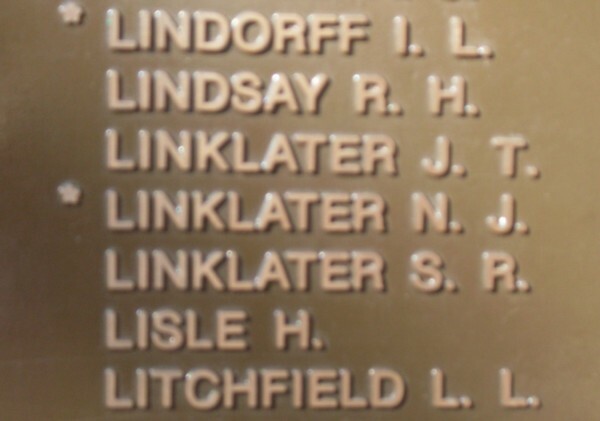 Brother of VX22679 Norman James Linklater (2/2 Pioneer Battalion)? At enlistment : single. No previous military experience. At discharge : height 5 feet 9 inches, blue eyes, red hair, fair complexion. Marital status : single. Marks / scars : appendix scar, scar left leg and scar right buttock. Full time war service : A.I.F. (24/06/1940 to 07/01/1946) which included 2024 days active service (88 days within Australia & 1649 days overseas). Operational service : Syria / Java area, embarked from Australia 07/04/1941, disembarked in Australia 11/10/1945. War badge no. 187375. Discharge certificate no. 481668. 24/06/1940 Taken on strength by R.R.D. 29/06/1940 Transferred to 10 Training Depot, Bendigo, Victoria. 21/09/1940 Transferred from 4 Training Battalion to 2/22 Training Battalion, Bendigo, Victoria. 09/10/1940 Posted to 2/2 Pioneer Battalion, Puckapunyal Camp, Seymour, Victoria. 01/11/1940 Admitted 4 Australian General Hospital (post vaccination reaction). 07/04/1941 Embarked Sydney, New South Wales on H.M.S. Queen Mary. 19/06/1941 Evacuated 1 Australian General Hospital (wounded in action shrapnel wound right buttock) & transferred to "X" list. 22/07/1941 Discharged 1 Australian General Hospital & transferred to Pioneer Training Battalion. 14/08/1941 Marched out to 2/2 Pioneer Battalion. 15/08/1941 Taken on strength by 2/2 Pioneer Battalion. 11/10/1945 Disembarked in Australia after repatriated on M.V. Highland Chieftain. 18/10/1945 Marched in to General Details Depot from 115 (Heidelberg) Military Hospital, Melbourne, Victoria. 03/11/1945 Granted proficiency pay as from 15/08/1945. 03/01/1946 Marched in for discharge.